Aspiring video game map maker Shua Llorente had no idea what he was getting himself into when, in June, he released a video of his mockup of a Busan map for Overwatch. The video pulled in over 150,000 views thanks to just how much it felt like an actual Overwatch take on the real Korean city. This month, Blizzard surprise-revealed its own Busan map. People have questions. The comments of Llorente’s video are now a deluge of questions: How does he feel about Blizzard’s map? Did he work on it? Or, more nefariously, did Blizzard rip him off? People are hitting him up with similar questions on Twitter, to which he has not replied. Others are outright making accusations that Blizzard copied the map. 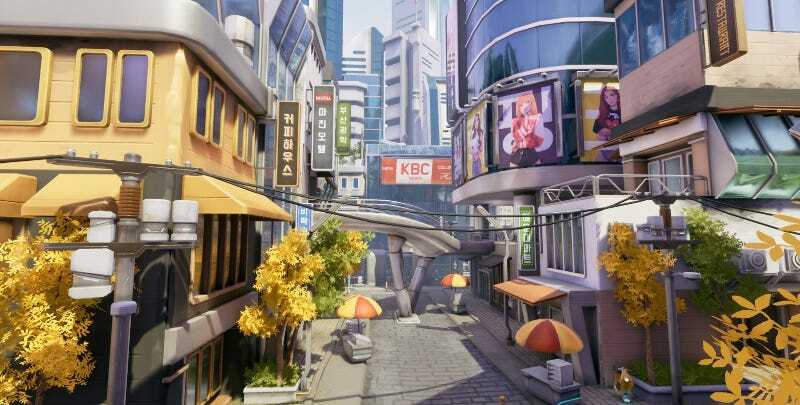 Llorente has created a whole series of Overwatch-inspired maps in Unreal Engine 4, and his Cairo map even caught the eye of professional proud papa and hobbyist Overwatch director Jeff Kaplan, who wrote Llorente back in January, “Amazing work! We’ll be in touch.” So it makes sense that people would wonder if Llorente had something to do with Overwatch’s latest map. According to Llorente, Kaplan and co were not in touch with him for Busan—though he says Blizzard did reach out to him over Skype earlier this month to discuss his work and say that the team really appreciates his efforts. Llorente also doesn’t think they used his map as a point of reference for theirs. “I don’t think Blizzard was inspired by my map,” he told Kotaku in an email, “since I’m the one who was inspired by their environments, and I’m the one who uses their map as a guide in creating my own maps.” He also noted that “a lot” of people have been asking if he was involved in the map’s creation. Kotaku reached out to Blizzard to ask if the official Busan map was inspired by Llorente’s take on the idea, but as of publishing, the developer had yet to respond. For now, Llorente is mostly just happy that an official Busan map exists. “We were impressed with their work and are glad to share our official Busan map release on live servers soon,” the rep said.